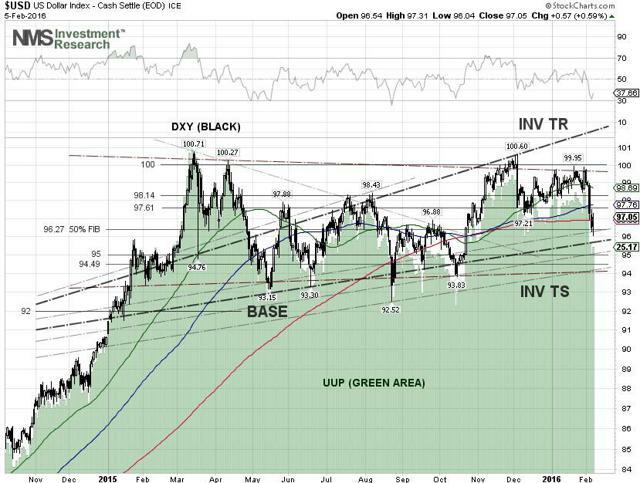 A direct inverse correlation between the crude oil price and the DXY chart patterns has been established. The WTI crude oil price turned bearish after breaking down the lower trendline support of the descending wedge chart pattern. It might be too early to call a crude oil bottom until a DXY trend reversal emerges. T. Boone Pickens told CNBC on February 1 that U.S. crude hit bottom at just above $26 per barrel, and based on history, prices should double within 12 months. Hedge funds seem to agree with Mr. Pickens, as they have been either adding to their long positions or cutting back on their short positions of light sweet crude oil futures during the past two weeks, according to the Commitment of Traders data released by the Commodity Futures Trading Commission. It might be too early to call a bottom, as any talk by Federal Reserve officials about aggressive rate hikes from now until the next Federal Open Market Committee (FOMC) Meeting on March 15 and 16, could drive the U.S. dollar higher and send the crude oil price tumbling. Crude Oil and Dollar Correlation - There is no simple explanation for how crude oil prices and the U.S. dollar are correlated. 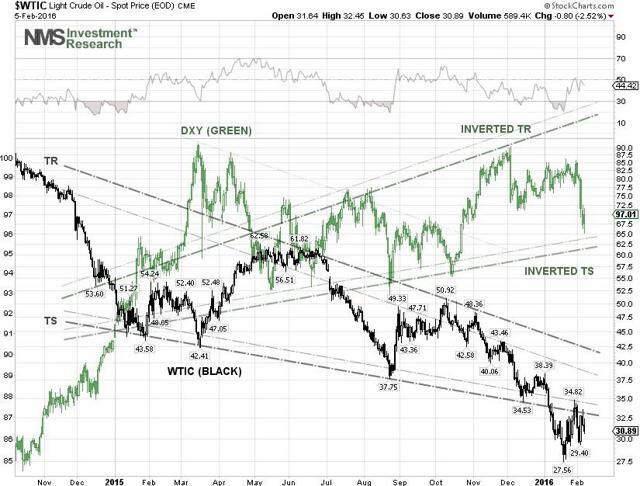 The general consensus is that crude oil prices move in inverse correlation with the U.S. dollar, meaning the crude oil prices would fall as the dollar strengthens, and vice versa. According to Business Insider, a recent report by Goldman Sachs' Jeffrey Currie shows that such rationale has broken down in the wake of the American shale revolution. Currie explained that the U.S. net imports of crude oil have reduced significantly since 2008, as U.S. shale production has surged. This has "significantly reduced the correlation between commodities and the U.S. dollar," said Currie in his report. Our latest study shows that crude oil prices do not correlate well, in many instances, with the U.S. dollar index (DXY), a weighted index of the value of the U.S. dollar relative to a basket of six major currencies, but found that a direct inverse correlation exists between the crude oil price and the DXY chart patterns. 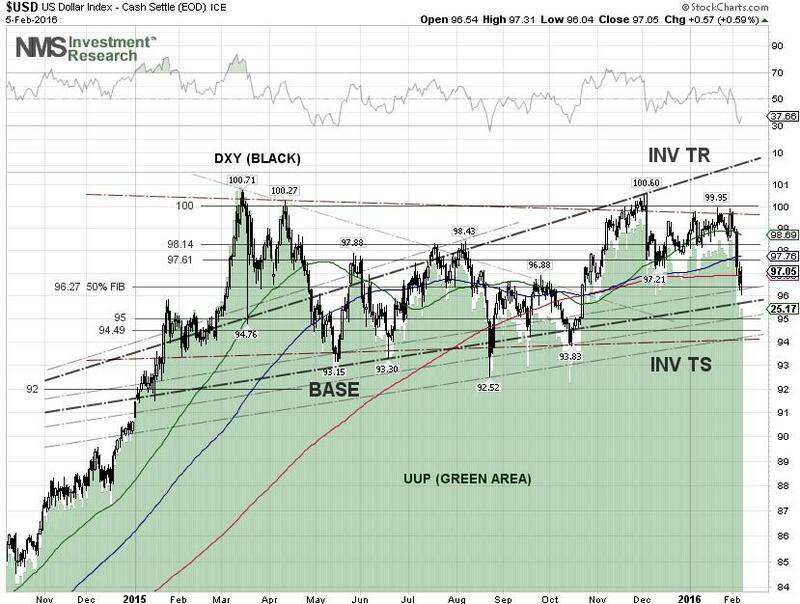 The crude oil price and DXY chart patterns are, in fact, mirror images of each other. Technically, crude oil prices have been moving in a bullish descending wedge chart pattern since the beginning of 2015. The DXY, on the opposite side, has been moving in a bearish ascending broadening wedge chart pattern, with a breakout during the March to April 2015 period, reflecting the Greek debt crisis and the European Central Bank (ECB) quantitative easing program. 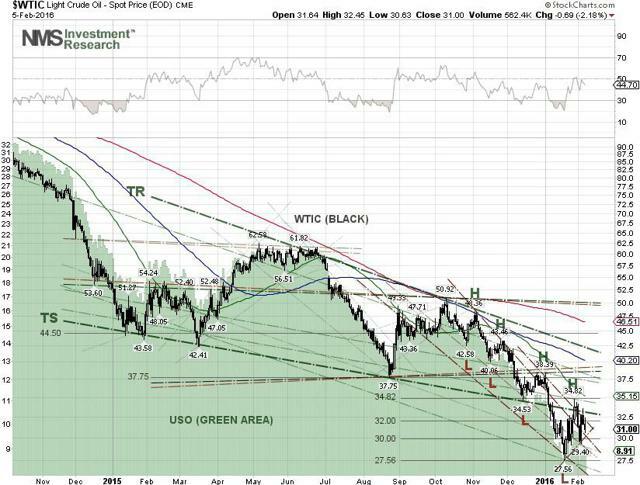 Crude Oil and U.S. Dollar Technical Outlook - Technically, the WTI crude oil price turned bearish after breaking down the lower trendline support of the descending wedge chart pattern. The crude price bounced off the trendline support, but was unable to break back into the wedge pattern. The crude oil price is now at risk of pulling back further to retest the January 20 low, at $27.56 per barrel. The fact that the crude price has also been moving in a lower-low chart pattern since October 2015, meaning every low is lower than the previous low, a trend reversal will only occur when the crude price moves higher to close and stay above $34.82 per barrel, or $38.39 per barrel. From the chart, the U.S. dollar index has been trading in a range between 94 and 100. The DXY recently topped out at the 99.60 level in January, and pulled back sharply after some Fed officials turned less hawkish on their rate hikes. There is a trendline support (INV TS) at around 95.80, where the dollar index can bounce off. The U.S. dollar index trend reversal will occur if the DXY breaks down the trendline support to levels below the base of the wedge, at around 92. Thus, from our viewpoint, it might be too early to call a crude oil bottom until the DXY trend reversal emerges. Two popular exchange trade funds (ETFs), United States Oil Fund LP (NYSEARCA:USO) and PowerShares DB US Dollar Index Bullish (NYSEARCA:UUP), offer investors exposure to crude oil prices and the U.S. currency without using a futures account. USO tracks the daily price movements of the WTI crude oil price and shows a strong positive correlation (+0.95) with WTI crude oil over a 16-month period. UUP is designed to replicate the performance of the U.S. Dollar Index and shows a strong positive correlation (+1.0) with the U.S. Dollar Index over a 16-month period. Conclusions - Crude oil prices and the U.S. dollar do not correlate well, in agreement with the report by Goldman Sachs' Jeffrey Currie. However, a direct inverse correlation between the crude oil price and the DXY chart patterns has been established. Crude oil prices are at risk of moving lower if the price can't break the trendline resistance of the wedge chart pattern. It might be too early to call a crude oil bottom until a DXY trend reversal emerges. The headline risks are Federal Reserve officials still talking about aggressive rate hikes until the next FOMC Meeting on March 15 and 16.